The headline news associated with the release of the new Census data was that poverty had declined. Indeed, the decline in the poverty rate was statistically significant and occurred primarily among children. Not to rain on that parade, but the poverty rate remained 2.0 percentage points higher than in 2007. Median family income in 2013 according to the Census was $51,939, compared to $56,436 in 2007. The median means that half of households had higher incomes and half had lower ones. The table above presents the thresholds for being in different parts of the income distribution. For example, a household with an income of $150,000 is at the 90th percentile point, or in the top 10% of the income distribution. 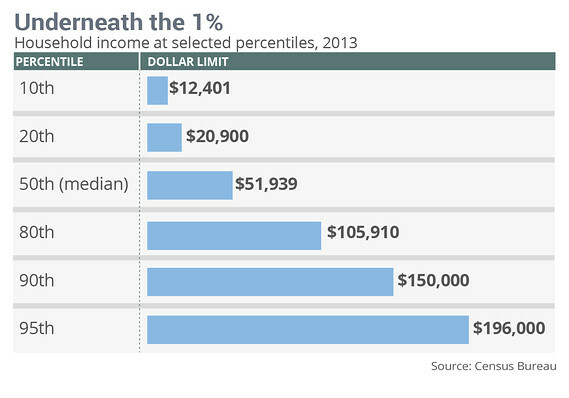 Even more amazing, a household with an income of $196,000 is at the 95th percentile, or in the top 5%. The thresholds must be interpreted with caution because households include old and young, urban and rural, coastal and midland, and small and large. Yet, many of those with $150,000 of household income would be quite surprised to know that they are among the richest 10%. These thresholds come into play in general conversation and in policy debates. When people refer to the middle class, are they really thinking of households with incomes of $51,939? When financial service providers characterize their target market as the mass affluent, are they referring to the 20% of households with incomes over $105,910 or are they thinking of a much smaller portion of the population? In terms of the Social Security debate, many proposals suggest reducing benefits for the “affluent.” Since the maximum taxable earnings level for 2014 is $117,000, presumably such reductions would kick in for those with household incomes between the median and the 90th percentile. Do we really believe that households with incomes below $150,000 are so rich that they don’t need current levels of Social Security benefits? Regardless of where people stand on the policy issues, they should cut out this little table so that when they talk about the rich, the middle class, and the poor they have a common household income figure in mind. This entry was posted in news and tagged alicia munnell, income, marketwatch, Middle Class, poor, rich on October 2, 2014 by Site Admin.